Florist Ariella Chezar is known for a loose and playful style—an aesthetic that took root during her decade-long stint in the San Francisco Bay Area. Yet no matter where you live, her new book, (Ten Speed Press; $25), provides inspiration for how to best bring your yard’s beauty and bounty indoors. This excerpt is a gift for any antsy, cooped-up gardener—and a cheerful and fun activity that’s a harbinger for the warmer days to come. In winter, here’s one way to fast-forward to spring when you just can’t wait any longer: Clip the budding branches of quince, crabapple, or pear trees, smash the ends, and settle them into a container of just-warm ­water. Wait a few days, or even a week, and you’ll start to see those buds open up. Some will flower, others will pop out in pale green leaves. It’s that combination of leggy stems and tiny blossoms that’s so architecturally interesting. 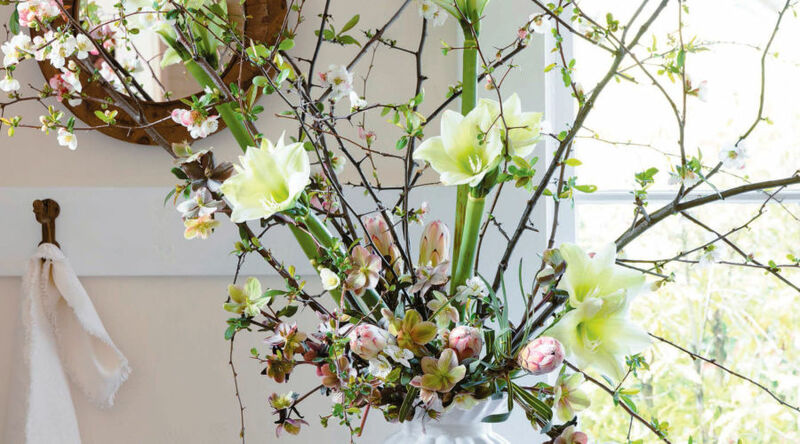 Here, I’ve taken inspiration from the pink-white blossoms of flowering quince by adding tall stalks of white or green amaryllis that stand at attention like soldiers. Next, I add hellebores, so popular these days that you’ll find pots of them blooming in the supermarket. Just snip a few blossoms, and when spring truly arrives, you can plant the rest of the plant in the garden. Proteas are another supermarket favorite that ­appear in late winter/early spring. The protea flower is not actually a single bloom but a flowerhead, or ­inflorescence, made up of many smaller, individual blossoms. Here the flowers are displayed in tight, bud form, but they can open up into dramatic players. Fill the vase three-quarters full with water. Trim the quince branches and cut an X in each stem to help it absorb water. Arrange so some branches arc down below the vase on one side, while on the opposite side, others reach for the ceiling to create an asymmetrical look. Trim and add the amaryllis, keeping the stalks as tall as possible. Cut two stems slightly shorter and position those toward the front of the vase. The longer stems can fill in at the back. These are your focal flowers and the goal is to have them explode out of the flowering branches. Trim and insert the proteas into the base of the arrangement, just above the lip of the vase. Together with the hellebores, they will form a pink “cloud” from which the taller elements emerge. Trim and add the hellebores, positioning some to hang over the lip of the vase, and others to snuggle into the ­arrangement. Alternate flowers. Use any fruit branches about to burst into bloom: apple, cherry, crab­apple, or pear. You can replace the amaryllis with white orchids, the protea with pink chrysanthemums. (c) 2018 by Erin Kunkel.